It's that time of year. Nights are getting longer and cooler. If you're craving comfort foods with a healthy twist, this month's featured recipe may be just the treat for you. As the days grow shorter and your "To Do" list grows longer, the last thing you have time for is a complicated recipe and lots of dishes. This casserole keeps the prep time and dirty dishes to a minimum, making it a mid-week family favorite. Perfect for soccer practice nights! 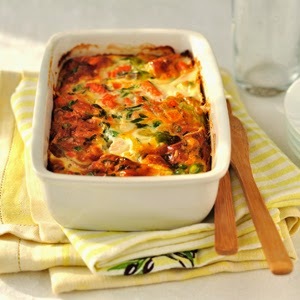 Our Skinny Veggie Casserole balances good taste with sensible nutrition. Because we use shirataki noodles instead of regular pasta, we cut a significant number of calories and carbs compared to more traditional versions. Bake and enjoy -- guilt-free. In a large frying pan, heat half of the olive oil, add all vegetables, salt, pepper, herbs, brown sugar and sauté until potatoes are cooked. Coat a medium size casserole pan with olive oil. Arrange Skinny Macaroni Noodles inside the pan, add cooked veggies. Add beaten egg and work into the macaroni/veggie mixture. Top with shredded cheese and bake in the oven for 20 minutes. Serve hot. Per Serving (without optional ingredients): 229 calories, 10g fat, 111mg cholesterol, 23g carbohydrates, 4g fiber, 13g protein. WW Points Plus: 6. Here's a great suggestion from Skinny Noodles fan Mary: Cut the potatoes and use 1-1/2 tsp Stevia in the Raw instead of the brown sugar to reduce to 162 calories and 7g carbs per serving!